There are seven species of woodpecker in Illinois. The males of all seven species have at least some red feathers on their heads. Woodpeckers are characterized by having zygodactylous feet (two toes point towards the front and two toes point towards the rear), stiff tail feathers and long tongues. Downy Woodpecker (Picoides pubecens): The downy woodpecker is a small black and white woodpecker approximately six and a half inches in length. 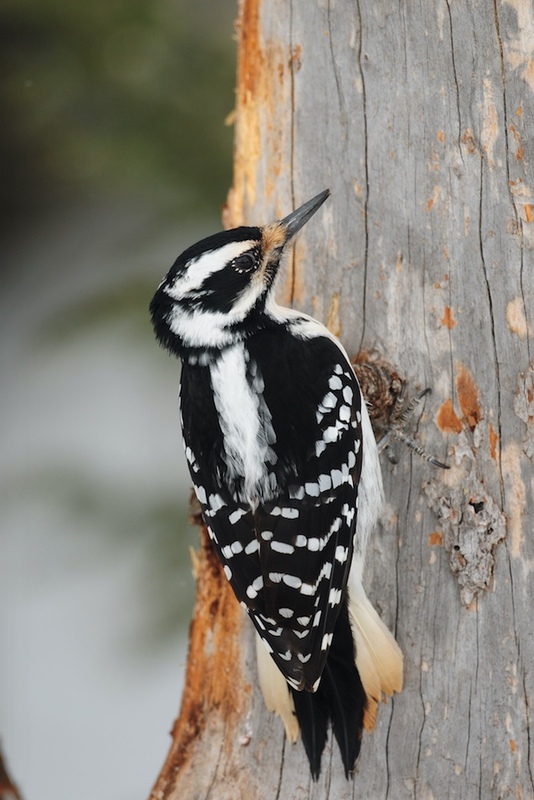 The two field marks used to distinguish downy woodpeckers from other woodpeckers are the white back and small bill. Males can be distinguished from females by a small patch of red on the back of their heads (females do not have the red feathers). The red patch of feathers on the back of the head identifies this as a male downy woodpecker. Hairy Woodpecker (Picoides villosus): The hairy woodpecker is a medium-sized black and white woodpecker approximately nine and a half inches in length. The field mark used to identify hairy woodpeckers is the white back. Hairy woodpeckers have almost identical plumage to downy woodpeckers but are larger in size and have longer bills. Male hairy woodpeckers can be distinguished from females by the red patch on the back of their heads. The lack of red on the head identifies this as a female hairy woodpecker. Hairy woodpeckers appear similar to downy woodpeckers but are larger and have slightly longer bills. Yellow-Bellied Sapsucker (Sphyrapicus varius): The yellow-bellied sapsucker is a medium-sized woodpecker approximately eight to nine inches in length. The three field marks used to identify yellow-bellied sapsuckers are the white wing patch, yellowish underside and red forehead patch. Males have a red throat patch and females have a white throat patch. Immature birds are brown but have the white wing patch. Yellow-bellied sapsuckers drill rows of vertical or horizontal holes in trees. Red-Bellied Woodpecker (Melanerpes carolinus): The red-bellied woodpecker is a medium-sized woodpecker approximately nine to 10.5 inches in length. The two field marks used to identify red-bellied woodpeckers are the black and white striped back and the red patch on the head. Females have only a red patch on the nape of the neck while males have a red cap that extends down the neck. The underside may have a blush of red feathers. Red-bellied woodpeckers can be identified by their striped back and the red cap on their heads. Red-Headed Woodpecker (Melanerpes erythrocephalus): The red-headed woodpecker is a medium-sized woodpecker approximately eight and a half to nine and a half inches in length. The field mark used to identify red-headed woodpeckers is the solid red head. 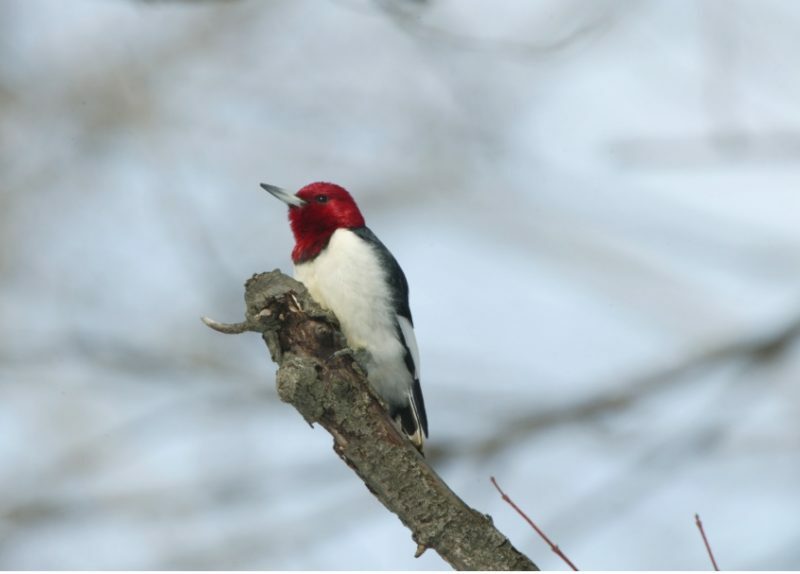 Red-headed woodpeckers have black backs and tails and white undersides, wing patches and rump patches. Sexes are similar in appearance. 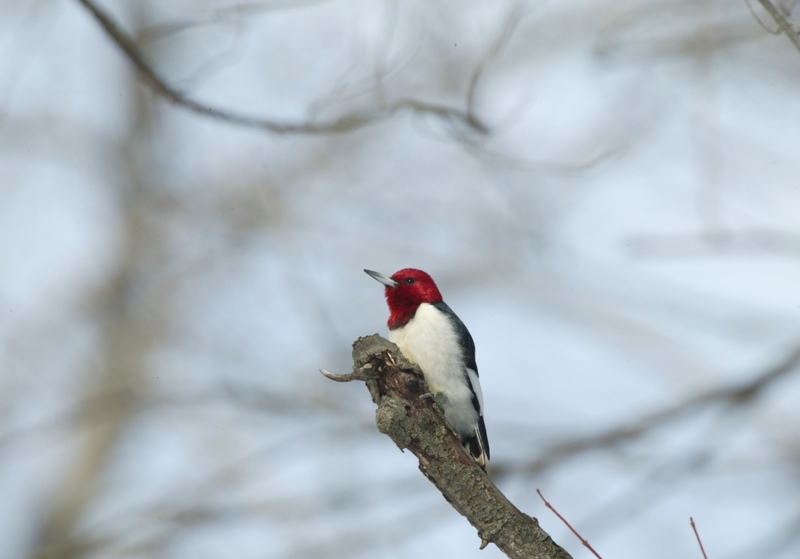 Red-headed woodpeckers can be identified by their redheads, white undersides and black backs. Northern Flicker (Colaptes auratus): The northern flicker is a large woodpecker approximately 12 to 14 inches in length. The two field marks used to identify flickers are the brown striped back and the white rump patch. Both sexes have black spots on the underside, a black collar and a red patch on the back of the head. Flickers have a yellowish cast on the tails and wings that can be seen when the birds are flying. Males have a black “mustache” that distinguishes them from females. The Northern flicker is identified by the striped back and white rump patch. Pileated Woodpecker (Dryocopus pileatus): The pileated woodpecker is the largest woodpecker in Illinois and is approximately 16 to 19.5 inches in length. 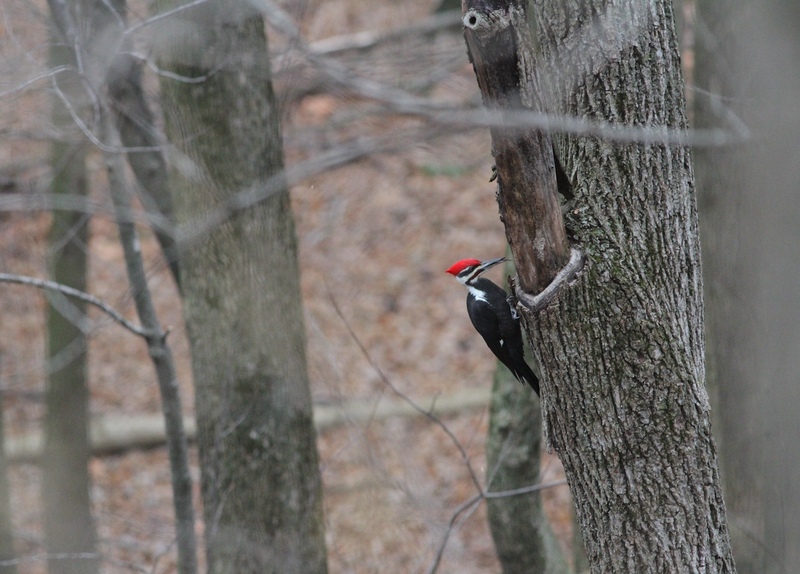 Besides their size, the two field marks used to identify pileated woodpeckers are the red crest on the head and the white patches on the underside of the wings. Males have a solid red crest and a red “mustache” while females have a red crest with a black forehead and lack the red “mustache”. Pileated woodpeckers are the largest woodpeckers in Illinois. Downy, hairy, red-bellied and pileated woodpeckers are year-round residents in Illinois. 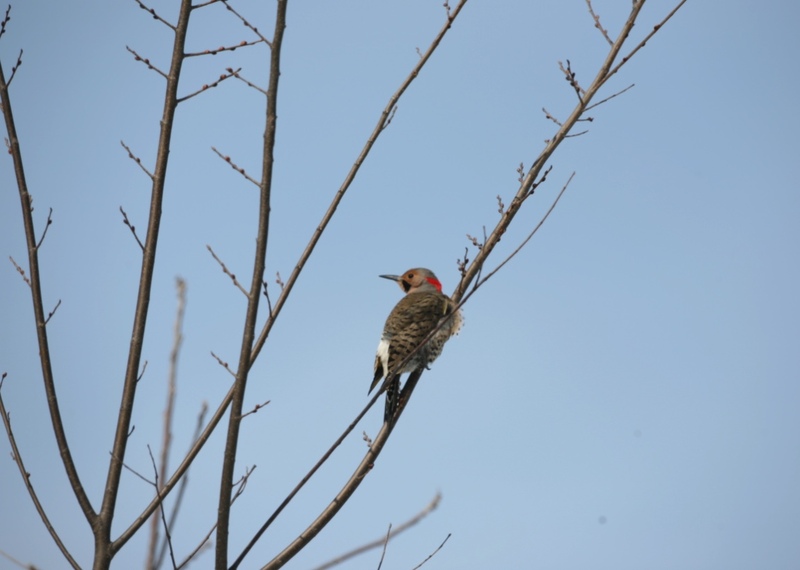 Northern flickers and red-headed woodpeckers are migratory, but individuals of both species can be found in Illinois even in the winter. Yellow-bellied sapsuckers are also migratory. Individuals of this species are typically found in Illinois during April and May and again in September and October on their way to and from nesting sites in the north. Woodpeckers are not songbirds. Instead of singing to attract a mate, woodpeckers display drumming behavior. In urban areas woodpeckers often drum on wood siding, TV antennas, gutters and downspouts. They may also drum on trees near homes. Drumming typically stops by summer once the woodpecker has found a mate and established its territory. 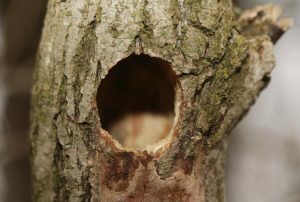 In spring and fall woodpeckers will excavate cavities for nesting and winter shelter. Woodpeckers also drill into trees or other wooden structures looking for insects. Yellow-bellied sapsuckers drill rows of holes in trees. They come back to favorite trees. Notice the freshly drilled holes below a row of older holes. Yellow-bellied sapsuckers do not normally drill on homes but can damage trees. These birds drill series of holes in the same tree leaving a distinct pattern of horizontal or vertical rows. Sapsuckers will use pine, spruce, birch and fruit trees. They often return to favored trees, and damage can occur in spring and fall as the sapsuckers migrate through Illinois. The holes can make the trees more susceptible to infestation by insects or disease. Woodpeckers are cavity nesters and drill holes to access the interior of the tree. Woodpeckers are an important predator of insects. Because woodpeckers prefer soft or dead wood, it is important to leave dead trees standing where possible to provide critical habitat for woodpeckers and other species. Abandoned woodpecker nests are often used by other species such as nuthatches and chickadees. Woodpeckers do not pose a threat to human health. Woodpeckers can be found in forests, woodlots, orchards, farms, and towns. Northern flickers are often seen foraging for ants on lawns in urban areas. 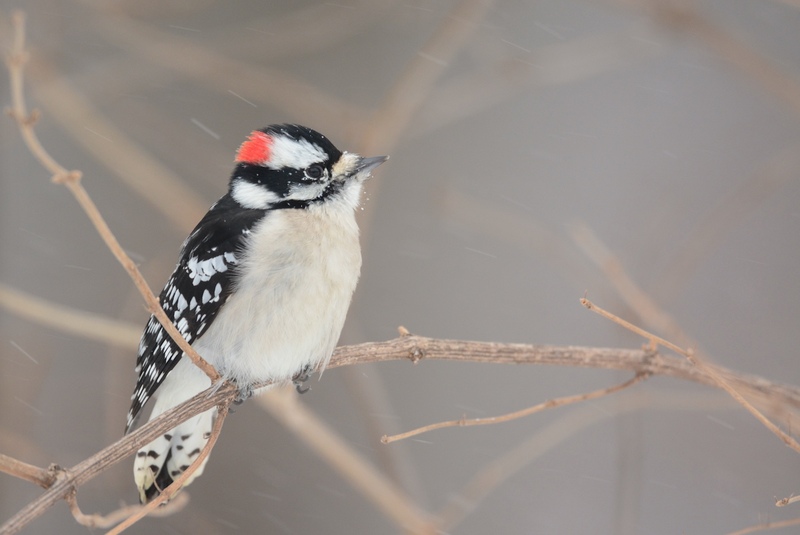 Downy and hairy woodpeckers can be found along woody riparian areas. Pileated woodpeckers are not as common in urban areas, preferring large blocks of wooded habitat. Yellow-bellied sapsuckers are often found in orchards. Downy woodpecker feeding at bird feeder. Most woodpeckers eat insects they find living inside of trees or other wooden structures. Northern flickers consume insects they find on the ground, particularly ants. Yellow-bellied sapsuckers eat sap from trees and insects that become stuck in the sap. Many species will also eat berries, fruit, nuts, and seeds when in season. Pairs are formed in late winter or early spring, and breeding territories are established. Breeding occurs in spring. Woodpeckers are cavity nesters and excavate a nest cavity in live or dead trees. 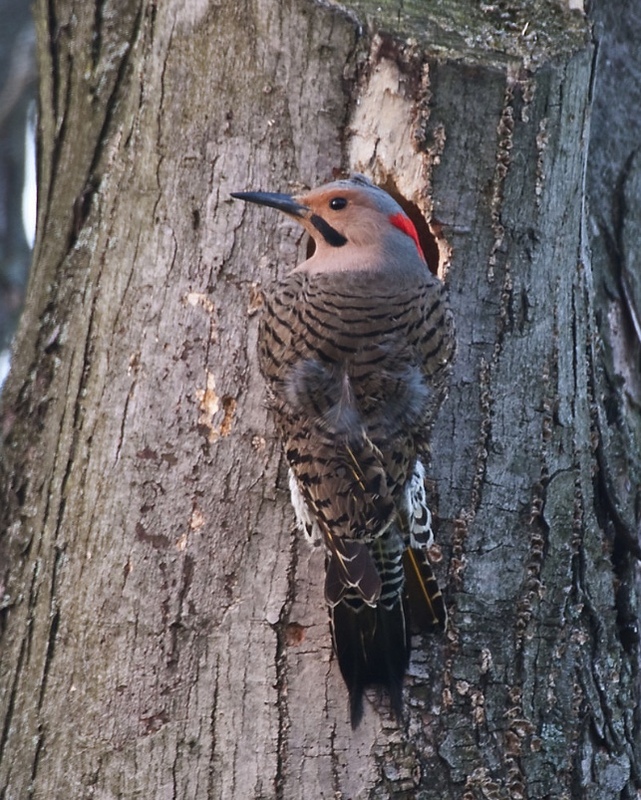 Some species will nest in utility poles, fence posts, or appropriately sized bird houses (northern flicker and red-bellied woodpecker). Woodpeckers are cavity nesters. 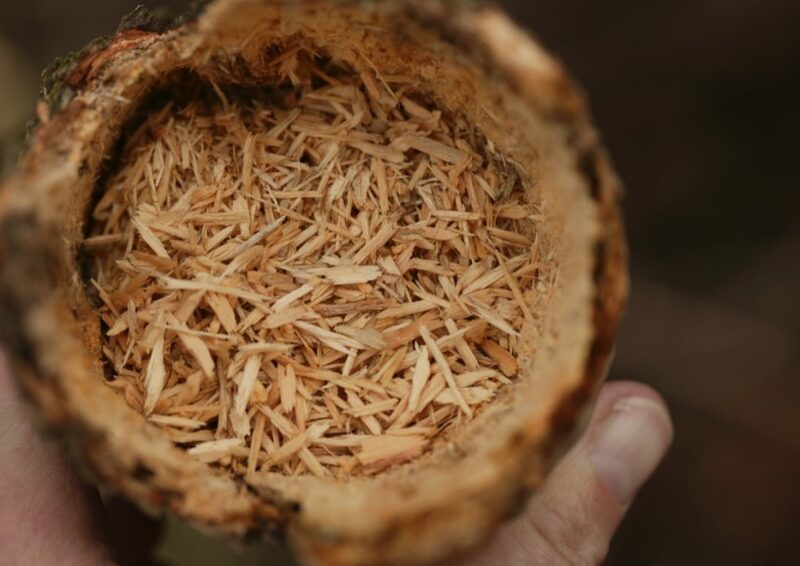 They fill the cavity in a tree or wooden pole with small wood chips. The eggs are laid on top. Excavation of a nest cavity takes one to two weeks. No nesting material is added; eggs are laid directly on the woodchips. Both sexes excavate the cavity and incubate the eggs. Females lay three to eight white eggs depending on the species. Incubation is 11 to 14 days for most species; pileated woodpeckers incubate eggs for approximately 18 days. Both sexes provision the chicks. Depending on the species, young fledge (leave the nest cavity) when they are 20 to 30 days old. Some species may raise two broods per season. Damage caused by most species of woodpeckers occurs mainly in spring and fall. They may drill drumming holes or nesting holes in the spring and roosting holes in late summer or fall. Woodpeckers also drill on houses looking for insects. 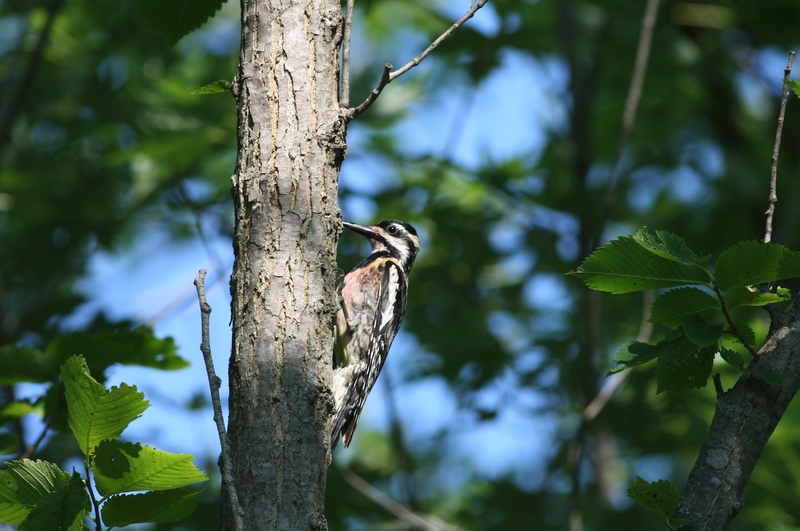 The Cornell Lab of Ornithology has a website that provides good information about woodpecker damage. A Northern flicker (woodpecker) drilled multiple holes in the wood siding of this home. 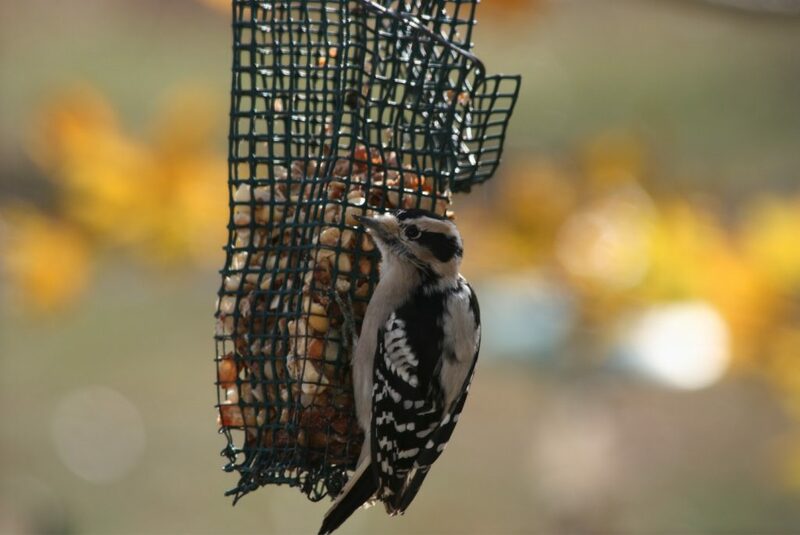 Start woodpecker damage control as soon as you see signs of damage. If woodpeckers are drilling on siding or cedar shake shingles to get to insects, remove the insects if possible. Woodpeckers will investigate by drilling if they can hear invertebrates under the siding or shingles. It can be difficult to get insecticides into siding to effectively kill insects, and insecticides can be harmful to birds. Caulking holes or insect tunnels may help. If the woodpecker is drumming or drilling nest or roost holes, treating for insects will not resolve the problem. Painting or using wood preservative on siding may deter drilling. If you are building a new home in a wooded area consider using vinyl or composite wood siding since these materials are usually less susceptible to woodpecker damage. 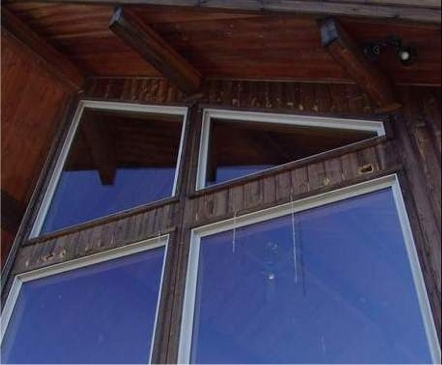 For more information about woodpecker damage specific to siding, read Cornell’s Types of Damage Specific to Siding. During colder months you can try providing suet cakes near damaged buildings to draw the birds away from the house. Some experts do not recommend this method. Discontinue providing suet if it seems to make the problem worse. Several different materials are effective at excluding woodpeckers. If woodpeckers are drilling siding underneath the eaves of a building, use three-quarter inch mesh netting. Attach the netting to the eaves and angle the netting back to the siding and attach below the damaged area. The netting should be taut but not overly tight. To keep woodpeckers from reaching the siding through the netting, it must be installed at least three inches from the siding. Metal or plastic barriers have also been shown to be effective at preventing damage. These materials are placed directly over the damaged area to deter the woodpecker from drilling. They can be painted to match the color of the siding. 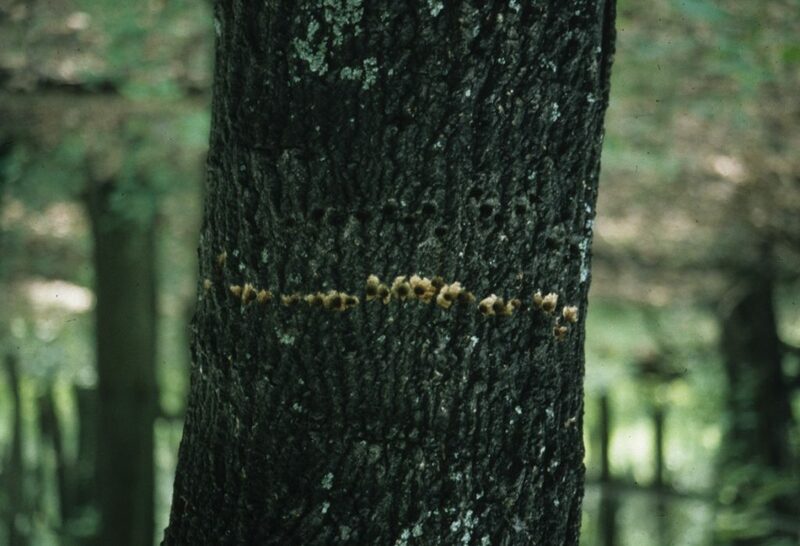 To protect trees from sapsucker damage, wrap trees with one-quarter inch hardware cloth or burlap during spring and summer. These materials should be removed from the tree during the fall and winter months. Sapsuckers often return to the same trees. By allowing access to their favored trees you may be able to prevent the sapsuckers from damaging other trees nearby. Several tactile repellents have proven effective at deterring woodpecker damage. However, the use of tactile repellents is not recommended because the products may impair the bird’s ability to fly or stay warm if the product comes into contact with their feathers. Visual and audio frightening devices can be used to deter woodpeckers. Stationary visual devices such as model owls are not usually effective after the first couple of days. Devices that move and are reflective are more effective. Strips of aluminum foil or Mylar tape, plastic toy windmills and suspended pie pans can all be used as woodpecker deterrents. Loud noises may work if the woodpecker has not established a territory. Yelling, hand clapping and banging on pots may all discourage a bird from using the area if persistently used. Playing a radio is not an effective woodpecker deterrent. Using several frightening devices together may increase their effectiveness. If a woodpecker is causing substantial property damage and other control methods have been ineffective at solving the problem, the bird may have to be removed. 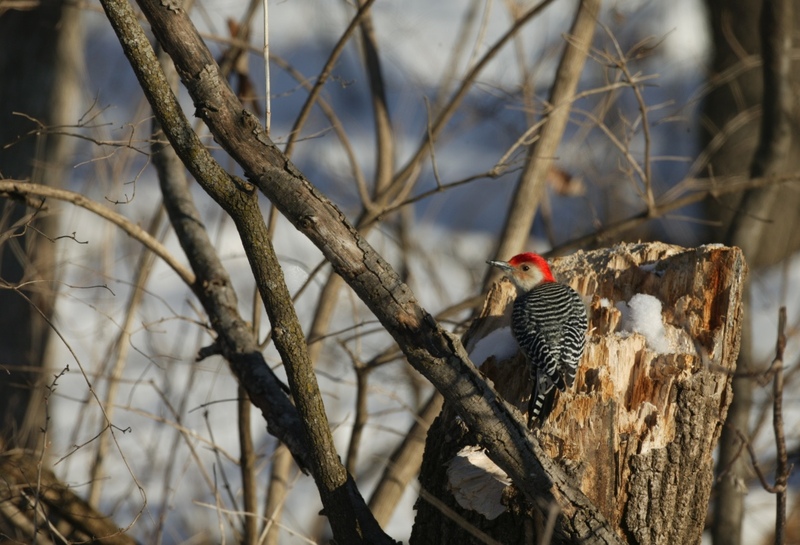 Woodpeckers are protected by the Migratory Bird Treaty Act and the Illinois Wildlife Code. They cannot be removed without the proper federal and state permits. Contact USDA APHIS Wildlife Services to request a removal permit at (217) 241-6700 or toll free at 1-866-4USDAWS. Woodpeckers are protected by the federal Migratory Bird Treaty Act and by the Illinois Wildlife Code. If woodpeckers are causing property damage contact USDA APHIS for help in dealing with the problem at (217) 241-6700 or toll free at 1-866-4USDAWS.